The property in question is located within the S1/2 of the SW1/4 of Section 1, in T9N R8E. CPRR acquired the federal patent on the land on December 6, 1898 (Doc. No. 94, BLM Serial No. CACAA 048728). This is located in the area of Clarksville, El Dorado County, California. ... it would seem that some institution must have received these records unless when ... Southern Pacific took it over, they would have the land records. These would certainly fall under their real estate division if they retained the old CPRR records. Thanks for any ... insight you might be able to provide. Democratic Party campaign poster. Rand, McNally & Co., 1884. Presidential election – Grover Cleveland (D) vs. James G. Blaine (R). Courtesy of Wm. Reese Co. This previous discussion is about another county, but the information may be helpful. Suggest you check previous title reports for the property and neighboring parcels to see where else the records might be held, as the County Recorder's Office seems to be the usual place. Also see other related discussions about CPRR land records. Also see this frequently asked question about land grants and section lands. Disclaimer: For informational purposes only. This website does not offer legal advice, and the above information may not apply to your real estate situation. It is imperative that you seek the services of a qualified real estate attorney if the need arises. ...The Nevada State RR Museum ... has the land records of the CPRR, but only those lands that are in Nevada. So they really won't help you at all. Union Pacific Railroad in Omaha is now the entity that holds all of the Southern Pacific and Central Pacific property records. If the deed was not recorded, then the only other recourse is to try to get a copy from UPRR. ... she would need to contact the UPRR real estate department in Omaha, NE and would need to provide any detailed information regarding the property. Most helpful would be a location map, such as a road map (AAA) that might also illustrate the rail line on it and where the property in question is located on that map. Also, the assessor's plat map that illustrates the property would be needed (vs. the township/range information). UPRR has the railroad valuation ("val") maps that show its property holdings. Once the property can be identified on the val map, the Schedule of Property (also shown on the val map) should show the Grantor/Grantee information and internal deed reference number. From that internal deed reference number, the actual deed can be pulled from UP's document custody area.....the deed may also be available electronically within UP as the deeds may all be scanned in by now. In any event, the property sale manager for El Dorado County at UP is someone named Tanya Spratt at 402-544-8574. The mailing address for the UPRR real estate dept. is 1400 Douglas Street, Stop 1690, Omaha, NE 68179-1690. A letter with the details and providing the mentioned maps would be helpful. As the real estate folks at UP are incredibly busy people, not sure how quickly a request like this can be dealt with, but this should be a good start. The California State Railroad Museum acquired a large number of Southern Pacific land records about 6 years ago from a successor company. I have copied in the Museum library staff with your question. 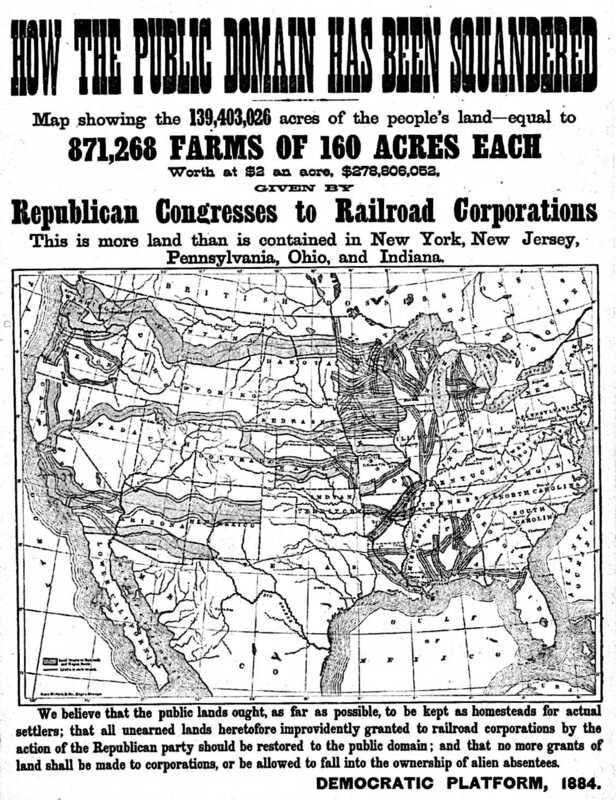 Comment regarding the 1884 campaign poster: The Democrat claim that the public lands were squandered by the railroad land grants and blaming Republicans, of course was silly because both the Democrat and Republican platforms of a quarter century earlier were strongly in favor of building the railroad and Congress approved the Pacific Railroad Act with its land grants at least eleven times. The land grants were not subsidies because the lands were almost worthless without the railroads, and even with the railroads, much of the western land was so arid as to be useless for farming and unsaleable. The amount of the initial lands granted proved insufficient to fund the construction and had to be increased, showing that the grants were carefully calibrated incentives to get the transcontinental railroad built. Cost to build a train? When did the transcontinental railroad end?